6.50 points at 14 votes (rank 503). 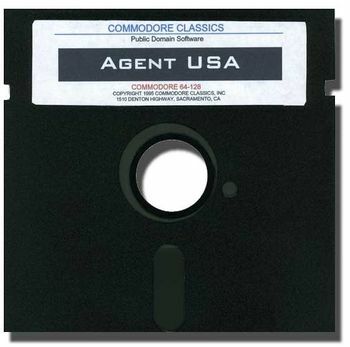 Agent USA is a mixture of arcade- and educational game by Scholastic, Inc. from 1984. 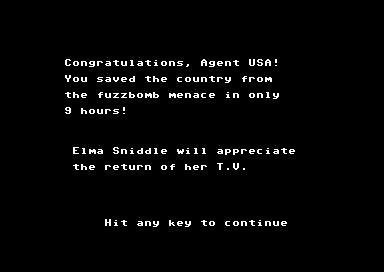 The player travels in the role of the smart Agent USA - a walking hat - through the United States of America in search of the sly "Fuzzbomb". This distinctive machine transforms every human being that it meets into will-less "Fuzzbodies", which on their part serve as carrier of the "Fuzz" and spread the plague even further. Only Agent USA can reverse this process with the help of his mysterious crystals (from space, of course!) and finally neutralise the originator. Info booths in the capital cities of the states help him to define the whereabouts of the Fuzzbomb, which he has to reach as fast as possible by train without getting "fuzzed" before. A story that could happen anywhere: The eccentric inventor Elma Sniddle experiments with a new TV machine, as she gets the fatal idea to use one of the confidentially-looking crystals, which had rained down from a meteor shower in her garden, as an energy source. But as soon as she had built in the crystal, the machine awoke to (of course evil!) life and shot at her with concentrated beam of pure fuzz energy which turned her into a distorted copy of herself. Unable to grab a clear thought, she staggered out of her flat, while the sinister television ran away towards the train station to take its heels. Only by a lucky coincidence she stumbled upon another crystal lying around in her garden and by this quickly changed back to normal. 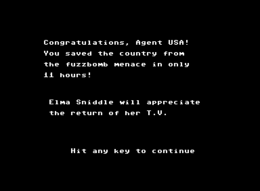 Then she promptly informed Helena Aldente from the CIB about the case and she put the special agent AGENT USA on the chase for the Fuzzbomb. 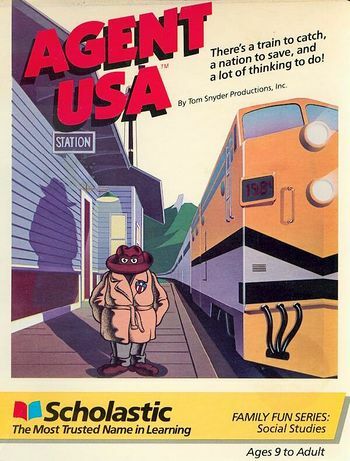 Agent USA is equipped with a VERY big hat and ten of the mysterious crystals and a CIB passport, which authorizes him to get handed out free tickets for the trains at all ticket booths in the whole country. But he has to hurry, as the Fuzzbomb transforms more and more honest and tax-paying people into mentally deranged Fuzzbodies and soon the whole nation will fall victim to the Fuzz. It would be the end of the world as we know it! 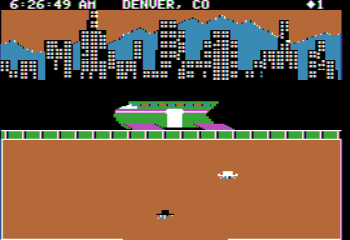 Graphics: Even for the circumstances in 1984 it is kept very blocky and barren. Each town looks exactly the same, except for the number of rooms and the skyline in at the station. Additionally, there are several day and night phases (sunrise, noon, sunset, night - with lights in the skyline or totally black depending on the time) which appears very atmospheric. Unfortunately, this has 0,0% effect on the game itself. Sound: Most of the time simple spot-FX. A pleasant surprise is, that the noises of the trains get louder and quieter when entering and leaving the station and they can also be heard in the other rooms of the station. 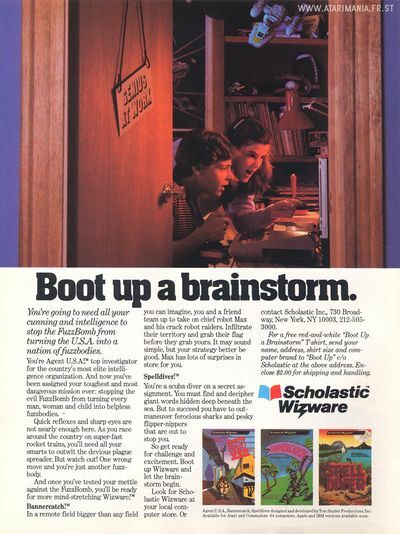 This also enriches the mood during the game and suggests a "working" world in the game. During the ride on the train one hears the starting riff of "Hey, Bulldog" by The Beatles, but in the rest of the game there is almost absolute - kind of ghostly - silence, unfortunately. An excellent horror vision: the Fuzzed States of America! Hey, joker... please do not enter fun names! Agent USA ponders about his next step at the station of NYC, while the world still pretends, that everything is alright. 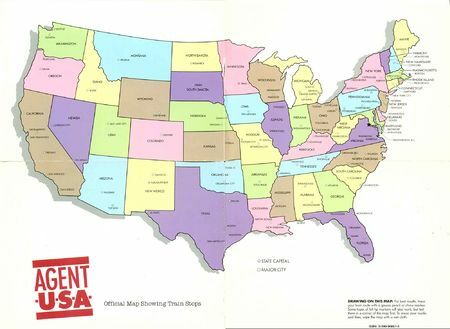 The Fuzzbomb and Agent USA start the game in randomly chosen towns of the USA. Depending on the difficulty grade, the Fuzzbomb has some time to fuzz around more or less successfully and a few towns are then already contaminated. Now as it is, the Fuzzbodies from the fuzzed towns enter the trains aimlessly and boom around carrying the fuzz from town to town. Each quite normal man touching a Fuzzbody, instantly turns into another carrier of the fuzz and soon another town surrenders the fuzz. The only remedy is the crystals from Elmy Sniddle's front garden, which turn the Fuzzbody back to a normally functioning member of the society, if one of the crystals is laid in the way of a straying Fuzzbody. Agent USA owns only 10 of these crystals at the start of the game, but - and it gets even more miraculous - he can make the crystals grow by laying them down somewhere and wating a bit. The crystals reproduce as if by magic as long as they are not collected by our hero or a passenger. 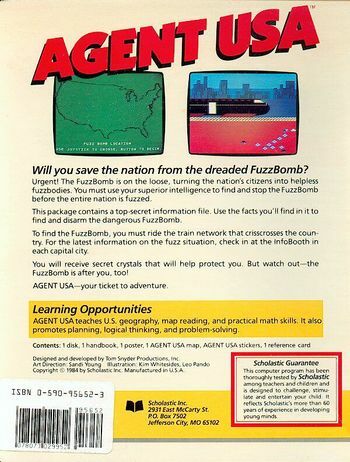 Agent USA needs to grow 100 crystals with this process to then do the Fuzzbomb in by touching it. But this is aggravated by the fact, that the inhabitants of the towns are crazy about these crystals and rather fill their own bags with them instead of leaving them to a higher purpose. Futhermore, the crystals immunise the one who carries them agains contact with the Fuzzbodies: with each touch the number of crystal carried only divides in halves. If no crystals are carried along, the next contact with a Fuzzbody turns one into a drooling, confused grumbler which urgently should go to the hairdressers: the hero cannot be controlled any more and everything is looooost! GAME OVER! To get from one town to the next, Agent US needs to use the local train connections. Here very slow choochoo trains and rocket driven supersonic trains (with integrated cinema, swimming pool and bowling alley) are available. The latter only operate between bigger cities. 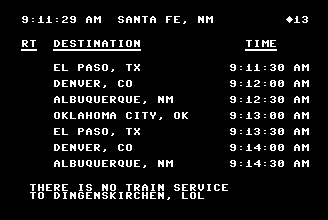 Information about when and where to a train will go can be seen at the ticket booth, which is available in every town - if there is no ticket booth in a town, then obviously you have hacked the game (congratulations from me! Fanfare & handshake), or how else could you have reached this station? At the booth all available connections are listed and Agent USA can now enter the place where he wants to travel to (please watch your spelling!). At the given time you should then be at the platform and enter the train. The waiting time can be passed by growing more crystals or stuffing waiting passengers into the trains. P.S. : Do not try the latter "in real" - this creates lots of trouble! These info booths can only be found in the corresponding capital city in each state and in Washington, D.C. They are utterly important to finish the game successfully, because here - and only here - you get the most important information of the game, the location of the Fuzzbomb. By moving the joystick to "City Info" you can also view the names of the towns and the number of people with crystals in this town (where did they get them anyway?). If you want to get the creep, you can view the forecast of the Fuzz spread, but this doesn't give you any advantage. With a bit of patience one can create Boulder Dash-like conditions. You get more information about the game, if you start it and wait about 20 seconds without doing anything. To enter the regional train in the USA you do not need a ticket! He just waits with boarding until shortly before the train starts. This trick does not work with the fast trains, as the conductor is not drunk enough to oversee the fare dodgers. If the town is already fuzzed, you need to hurry at the ticket booth when entering the desired town, as you can be touched by a straying Fuzzbody any time. If you are not be able to stand the pressure, you can cheat a bit and pause the game until you have e.g. finally typed "Cincinnati, OH" right. If passengers have collected a greater amount of crystals, they might use them in case of a Fuzz invasion to defend themselves. The game has day and night phases. This looks really great, but has no effect on the course of the game. To grow a stock of crystals you best look for a room with only one exit, which you then defend against arriving inhabitants by just pushing them aside while the crystals can grow undisturbedly. The version by Kevlar offers several trainer options. Robotron2084: "A sweet, small cult title of the Edutainment genre with a crazy story: walking hat chases a television gone wild which transforms everyone into Fuzzies... aha, I see! I always liked this game, although it is totally boring and kind of nothing happens. However, everything is put together charmingly and along the way you learn a bit of geography. I would say: Mission accomplished. But the game lacks diversity and this makes me play the game only once a few years. But then it is always fun. Seen objectively this makes 6 out of 10 points." H.T.W: "Well, the story is really "crazy", a hat with feet goes through the USA to hunt down a television, which turns inhabitants to idiots, with self-regenerating crystals. The guy who came up with that has a lot of fancifulness or strong herbs. But maybe exactly this crazy background is one of the reasons why every now and then I take this also informative game from the shelve and stampede the virtual United States. For me despite its simple graphics a very good game, which I can recommend to those who are open to innovative game ideas." mombasajoe: "Like: Crazy story and the indisputable charm of the at first funnily appearing graphic design. Not like: Illogical train connections, at the latest after the second train ride I found it a lengthy and bleak putting around, I think it totally overdrawn to lose 50% of ones crystals when touching an infected figure, as: due to the lack of scrolling there is a constant danger of touching someone in the infected cities when entering a different "room" (and above all this is not predictable... this made me most sick...), therefore there is a need of a somehow unnerving "farming" of crystals (e.g. to tide over the time while waiting for the next ride), in each town the same graphical solitude, altogether the permanently repeating course of the game without any highlight. Better learn American towns with file cards. This article made me curious, but unfortunately, the game itself has disappointed me completely." Every town in the game has an own skyline. In the case of New York you can even see the Empire State Building and the World Trade Center. Complete walkthrough through the game. Video at YouTube YouTube clip about "Agent Earth", a remake project. This page was last modified on 14 August 2017, at 23:22.